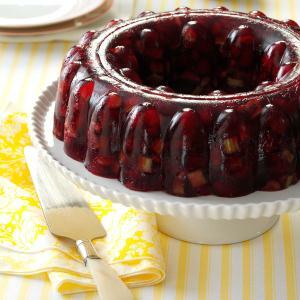 This restaurant recipe is for a Molded Cranberry Salad. Quite frankly, this is an item I rarely make today - not because this isn't a good tasting salad, but because many that were made in the '60's and '70's were nothing to brag about. In fact, many were terrible. 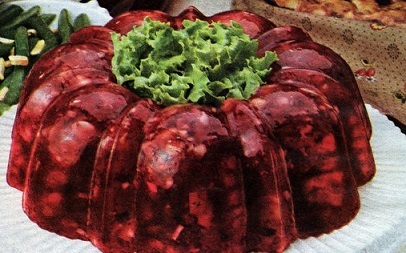 Having said that, older customers who are sponsoring a group meal (meeting) at the restaurant sometimes ask for a molded gelatin salad. This recipe "works." 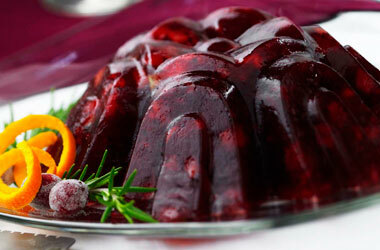 This can make a nice centerpiece for a large holiday party, if you use a mold. Otherwise you can cut the salad into individual portions from an 8 X 8 inch pan or see another serving option below. It is delicious and healthy. I like either walnuts or pecans in this recipe but you may substitute your favorite or you may omit the nuts altogether. Cranberries are a native fruit in America and are commercially grown in my home state of Washington. Depending on the year, Washington is the fifth or sixth largest producer of cranberries in the States. Massachusetts is the largest producer of cranberries in America by far, with New Jersey, Oregon and Wisconsin also among the largest producing states. Canada (especially British Columbia and Quebec) also produce a lot of cranberries. Cranberries were first used by Native North Americans, who discovered the wild berry's versatility as a food (especially in pemmican - a combination of dried deer meat, fat and cranberries), fabric dye and as a healing agent. American seamen carried cranberries on their voyages to prevent scurvy. In the early 1800's, Captain Henry Hall became the first to successfully cultivate cranberries. Today cranberries are farmed on approximately 40,000 acres across the northern United States and Canada. Preparation time: 20 minutes. Serves: 8-10. Serving Option: Pour the salad mixture into individual molds or specialty glassware (martini glass, for example) for individual portions. Great fun! 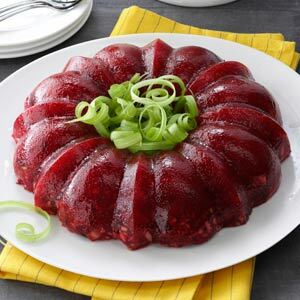 Enjoy your restaurant recipe for a molded cranberry salad and the company of those you share it with! Enjoy all the restaurant recipes on the website. Did you know? In Utah where Jell-O is the official state snack, these molded gelatin salads are available in local restaurants.